Proximal gastric vagotomy (PGV) selectively denervates the acid-producing part of the stomach (the body and fundus). The operation preserves the vagal innervation of the antrum and pylorus, making a gastric drainage procedure unnecessary. The operation is sometimes also referred to as highly selective vagotomy (HSV) or parietal cell vagotomy (PCV). Strictly speaking, the latter appellation should only by used when the operation is performed while the effect on parietal cell function is monitored either with an intragastric pH electrode or Congo red spray. PGV reduces both acid and pepsin secretion. Basal acid secretion is reduced by 80%, while maximal acid response to pentagastrin or to a meal is reduced by 50–60%. 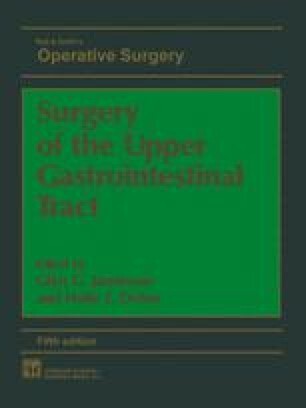 The rate of ulcer recurrence has varied from 2% to 22% among different surgeons, presumably because of variations in operative technique1. Although several potential sites of incomplete vagotomy are possible, the most important determinant of ulcer recurrence appears to be the thoroughness with which the distal 6–8 cm of the oesophagus is ‘skeletonized’ of vagal fibres. Hallenbeck et al. compared the results of PGV in which only the distal 1–2 cm was skeletonized with that in which the distal 5–7 cm of the oesophagus was denervated2. The former operation was associated with a 15.4% incidence of proven recurrent ulceration and a 10.2% incidence of suspected recurrence. By comparison, when 5–7.5 cm of the distal oesophagus was skeletonized, only one of 14 patients developed a recurrent ulcer.